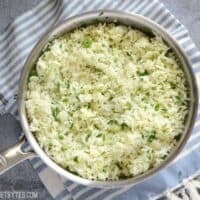 Cilantro lime rice is a bright and flavorful alternative to plain white rice and works great as a side or stuffed into burritos. Add 3 cups of chicken broth to a medium sauce pot (if using Better Than Bouillon or another soup base, fully dissolve the base in the water before adding the rice). Add the rice to the pot, place a lid on top, and bring the pot to a full boil over high heat. As soon as the pot reaches a full boil, turn the heat down to low and let the pot simmer for 20 minutes. After 20 minutes, turn the heat off and let the pot rest for 10 minutes, with the lid in place, undisturbed. While the rice is cooking, prepare the cilantro lime mix. Rinse the cilantro well. Pull the leaves from the stems and roughly chop the leaves with a knife. Use a fine hole cheese grater or zester to remove the thin green layer of zest from the lime. Add the chopped cilantro, lime zest, juice from the lime, and 1 Tbsp olive oil to a bowl. Stir to combine. When the rice is finished cooking, fluff the rice. Add the cilantro lime mixture and fold to combine. Avoid vigorous stirring as this can make the rice gummy. Gently fold the flavor in.